Quality, customized furniture is our goal and our promise. Every piece of log furniture is handcrafted to bring you a beautiful and unique piece of art. While conventional furniture often features pristine wood surfaces, graceful lines and delicate legs, we at Twist of Nature create log designs that boast the uniqueness of knots, grain irregularities, powerful log lines and overall character of the log. Our Norway Pine logs are local or trucked in from northern Minnesota. 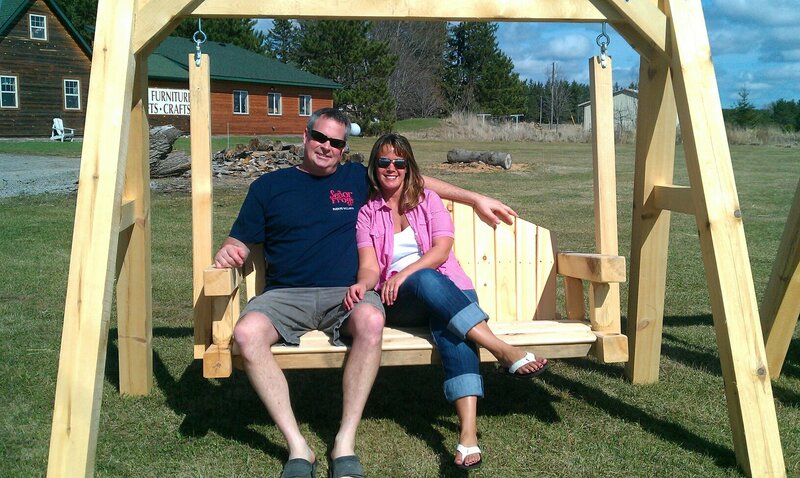 Our workshop is located in Princeton, Minnesota, where each log is hand and water peeled, hand sanded, dried and turned into a custom creation for our customers to use in their homes and cabins. It’s the details that matter, right down to each pick, split or miter. Hand and water peeling helps preserve the pine’s beautiful grain, rustic knots and unique color variation. We take special care in this process to ensure quality. Hand and water peeling helps preserve the pine’s beautiful grain, rustic knots and unique color variation. All logs have been dried naturally and may have worm tracking, cracks and checks. This adds to the natural beauty of the wood and also gives each piece its own character. Cracks and checks do not affect the structural integrity of the furniture. All of our furniture is hand sanded as well, and the ends are tenoned to enforce rigid construction. Our furniture is built to last, and we know you will enjoy it for years to come. Custom Furniture You name it, we can build it! Twist of Nature offers beautiful, expertly-crafted custom furniture based on your individual needs. Most pieces available in our store can be made custom-fit to your specifications. All orders are completed within 2-6 weeks depending on size of the order. Exceptions can be made whenever possible. A 35% deposit is required on all custom orders. Due to the natural beauty of pine logs, you can expect variation in character, color, cracks/checks and possible worm tracks. You may order your furniture with extra rustic appeal or more of the traditional cleaner log look. All furniture comes with a finish of 2 coats sanding sealer and 2-4 coats of lacquer, unless specified. Tim Gross (pictured left) first started Twist Of Nature as a passion project in 1996. Fueled by his love of crafting and a blissful cabin-style aesthetic, he built this business from the ground up with his bare hands. Tim is the person behind all of the craftsmanship.